I’m about to say something that will likely not be popular…I am not a fan of those huge gallery walls above sofas in living rooms. I like smaller gallery walls in bedrooms or offices, but nothing about curating a ton of stuff to hang above sofa sounds like my idea of a fun time. So, when thinking about what the heck to do in the apartment, I knew a collection of small stuff was not going to happen, but I did have a lot of wall to work with, as you can see below. Pee Wee was so cozy and refused to move for the shot. I’m so happy he likes the apartment. Thank goodness! I hopped on Minted because I am addicted to their artwork. It’s unique, artsy, trendy, and you can find anything, and I mean anything, on their site. 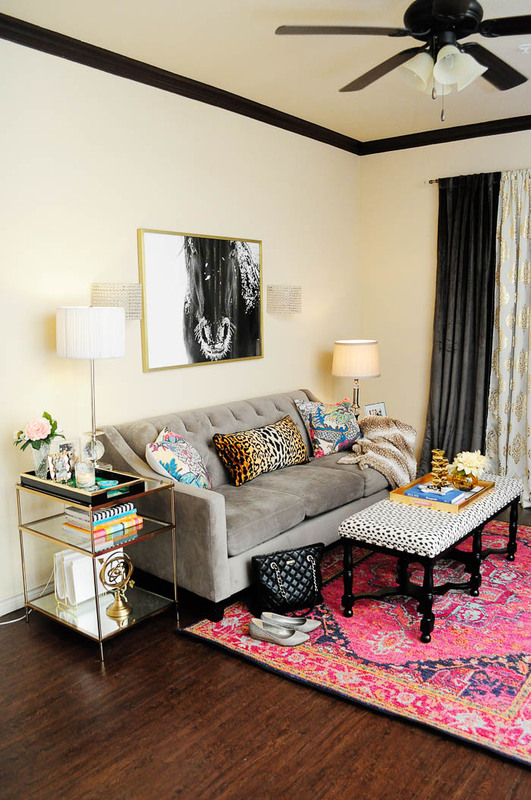 I’ve been really drawn to horse and equestrian type artwork lately, and since I live in an apartment that’s dark and warm, I feel a bold horse print works well to balance out the pink rug, animal print and gold everywhere. They generously sent me the art print for the apartment, and they’re sponsoring a mega giveaway for two of my readers (details at the end of this post). I was smitten with the print I chose as soon as I saw it. I’ve shopped on Minted before for the house, and I took hours and hours browsing for just the right artwork. With this print, I saw it and was sold on it being in my home in under 5 minutes. It’s striking and I LOVE IT SO MUCH. Cue Katy Perry’s Dark Horse. I love sites like Minted where you can get limited edition art on a budget, and it’s truly a great place to shop for Christmas gifts for those friends who have everything. To give someone an art print of an animal, place, color, design, or pattern they love is so meaningful. Minted has art at all budgets, so keep them in mind for your holiday shopping. That gold frame, you guys. GOLD. FRAME. 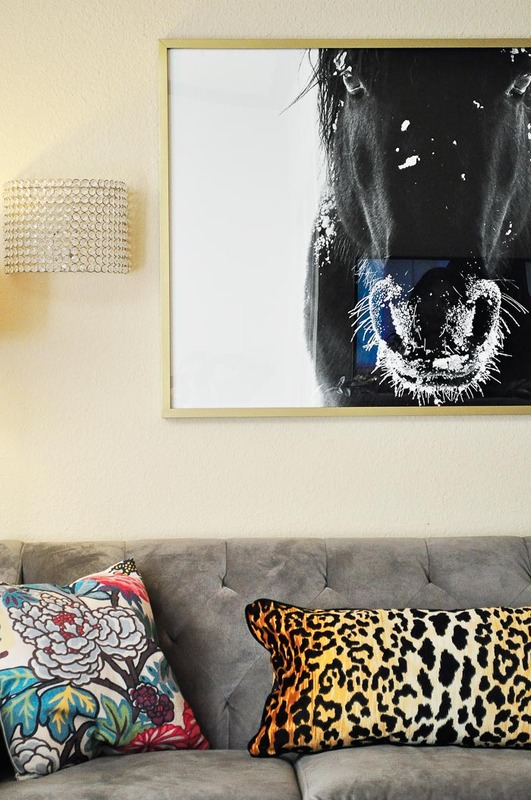 Selecting a large statement art piece is a commitment, so I opted for something I knew I’d like always (horses), plus kept it very color neutral (black and white). It’ll look great anywhere, no matter what. And here’s a wide angle shot so you can really see the scale of this art piece. It’s 30″ high and 40″ wide. Hanging it up was a two person job, but it was fairly easy thanks to the D-rings on the back. Some tea light sconces from Home Goods flank the Frost Bite print. Isn’t it stunning? You’ll likely also notice I moved the end table from the house over here now, so I got to accessorize a bit. It’s starting to feel a little more full in the apartment. Besides my new art print, I also got some curtains to layer in with the velvet blackout drapes I featured in my earlier post about this space. 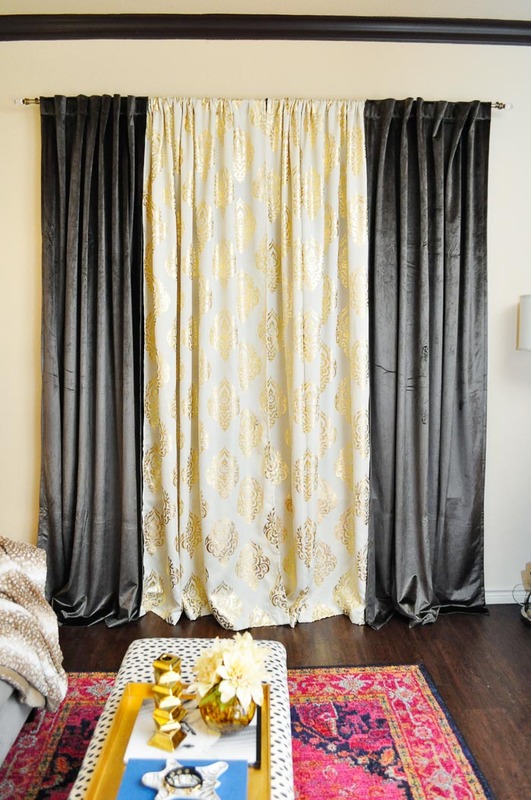 These curtains are from the Better Homes and Gardens collection at Walmart, and I snagged them for $16ish a panel. 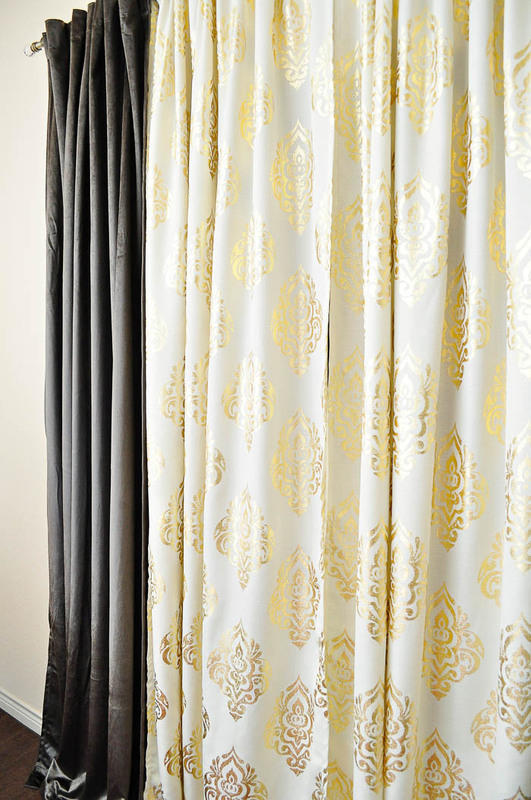 They’re a linen color with a gold foil damask pattern. They will frame our Christmas tree beautifully once that goes up in a few days weeks. Overall, I’m digging how this area is coming together and I enjoy spending my evenings in here watching TV or blogging. And I want to give a shoutout to my dear friend Maura for being such a sweetheart and sending me something from her shop, Pressed Intentions. 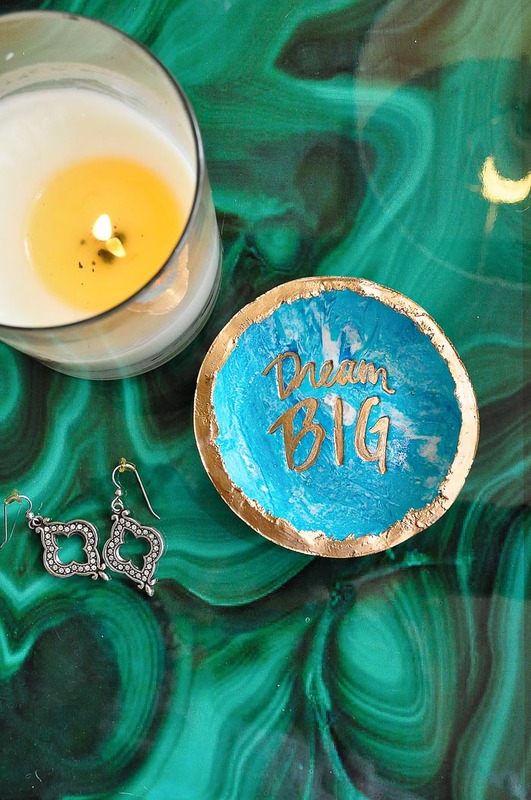 It looks right at home on my malachite tray, and it’s a nice reminder to keep on dreaming. It’s been stressful with selling a house (that still hasn’t sold), and living apart from my husband and Pee Wee. I’m trying to hang in there. As a token of my appreciation to you, I’m partnering up with Minted to giveaway TWO $125 gift cards to shop at Minted! There’s tons to buy, so I look forward to helping two of my readers get some new art for their homes. Open through 11/10 at 11:59 pm PDT to all U.S. residents. I’ll announce the winners in an upcoming post and show you all the other Minted item I have on order. Good luck! Enter the Minted giveaway here! Absolutely love the new artwork! It's perfect for the space. The addition of the gold and white panels looks so good–it's really looking like your place now! 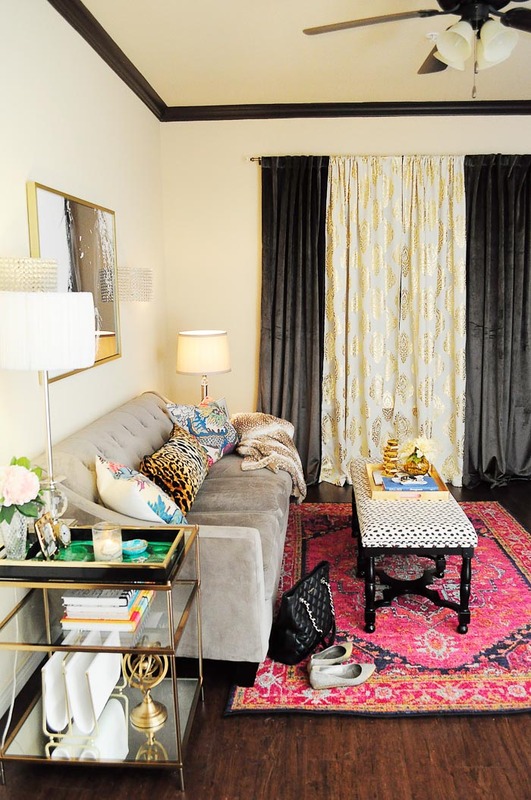 Love your apartment! I just redid my house and those animal print items would be great. Where do I get them? Think your work is amazing. I love it. I just redid my house. 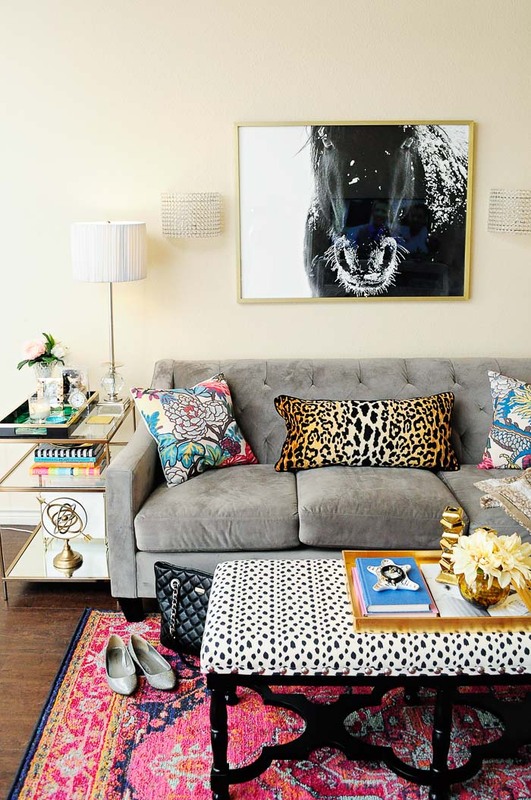 Need to get those animal print cushions,etc. You do amazing work. Love your horse, it looks perfect in this area.